The size of a shirt’s sleeves ultimately determines how comfortable it fits the wearer. Measuring the sleeve length of one of your shirts will help you determine your size. If you’re unsure of your actual shirt size and you need to buy new clothing, always be sure to measure your sleeve length as well as your neck length. There are two ways you can measure your sleeve length. In fact, if you have someone to help you out, the process will be even easier as they can do the measuring on you. Otherwise, you’ll need to directly measure one of your own shirt’s sleeves, and then move on to measuring the neck to make sure you get everything right. Have you ever worn a shirt and felt trapped? Wearing a shirt with the wrong size of sleeves is one of the most uncomfortable day-to-day things that we must face. Wrong sleeve-sized shirts limit the movement of the wearer and make the overall feel of the shirt very uncomfortable, even if the fabric is good and comfy on its own. It’s important to get both sizes right or you might end up with an uncomfortable shirt. A common issue also presents itself whenever you want to buy a shirt for a family member or a friend: if you want to make it a surprise, you’ll need to give them the receipt, so they can change the shirt if it doesn’t fit them properly! Not knowing someone’s size makes purchasing clothing a risk you might not want to take. Sometimes, it’s worth it to ask for their sizes and save them the trouble of returning the shirt. Contrary to popular belief, sleeve length is not entirely related to the size of the wearer’s arms. This is because sleeves very rarely end up at the shoulder of a person – depending on the type of sleeve, they might end up going all the way up to the shoulder, or they could go up to the neck. Another important thing to note is that every person has different widths. Do not attempt to measure your own sleeve length on someone else – it simply doesn’t work, unless you both have the same measurements… But that’s not likely. Play it safe and measure yourself or ask a friend or relative to aid you with the measuring tape. The shape of a shirt also determines how good it ultimately fits. In some cases, the armholes are bigger, and this is directly reflected on the size of its sleeves. If the armholes of a shirt are too big, you might need to look for a smaller sleeve size to compensate this. Shirt manufacturers tend to follow a common size pattern, but keep in mind there are exceptions to this rule. 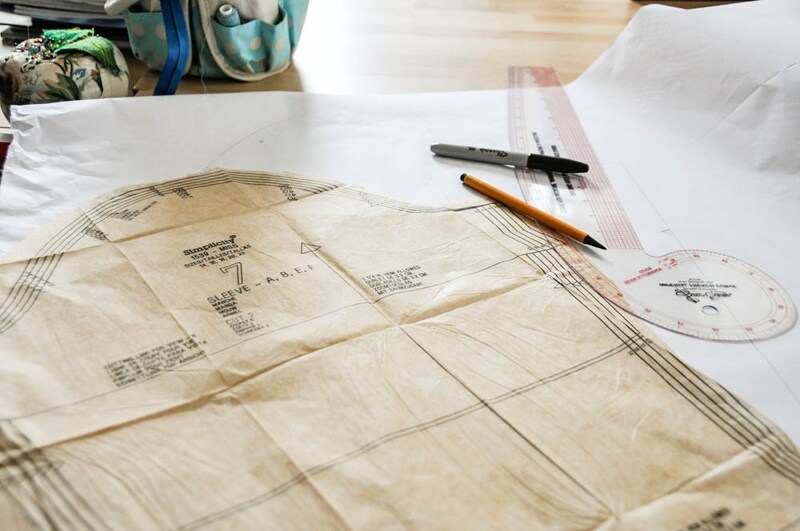 There are many types of armhole sizes and we’ll be guiding you through each of them, so you can get a better idea of what you need. Each shirt has a specific armhole sleeve type. 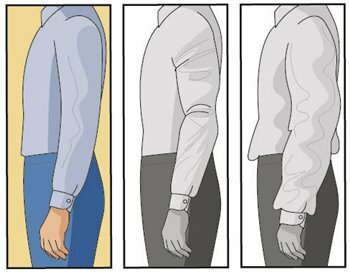 Each one defines how the sleeve is attached to the shirt itself. 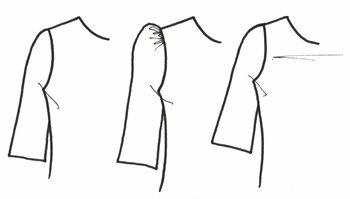 In total, there are 6 different types of sleeve armholes. Let’s look at each one individually. The main attribute of a set-in sleeve is that the seam is placed directly on the shoulder, and it goes all the way down the arm. This type of seam is usually more commonly seen in business and professional shirts; with them, clothing tends to look straighter, thereby giving it a professional look. If you’re looking for a shirt you can wear on professional events, these are the types of sleeves you’ll need to look for. If you’re measuring a jacket’s sleeve length, set-in jacket sleeves tend to be ideally made to be worn on top of a suit. They are also suited for business events. Set-in sleeves do have a problem: they way the seam is located makes the shirt feel like it doesn’t offer much movement. It does limit the freedom of the wearer a bit, but that’s because this type of clothing isn’t suited for casual wear. Raglan sleeves are the exact opposite of set-in sleeves. There isn’t any seam connecting the shoulder to the sleeve – it’s just one piece of fabric connected to the neck that goes on to become part of the sleeve itself. It goes all the way from the collar to the sleeve’s underarm. The continuous fabric makes the shirts very comfortable to wear. This sleeve design is often found in casual shirts and other types of sportswear. 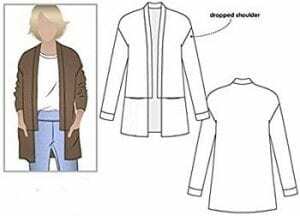 Jackets with this design allow you to wear bulky underclothing, because raglan sleeves have a lot of open space underneath the arm. The arms can also be moved around more freely. The wearer won’t have to worry about feeling trapped because raglan sleeves leave a lot of room inside the shirt. Also, there’s no seam on the shoulder! These sleeve types are ideal for casual wear. Drop shoulder sleeves are a type of set-in sleeve. The difference is that the seam isn’t really made to be located on top of the shoulder, but it rather drops down on the arm. This makes the sleeves look longer and saggy – but they look incredibly well in certain types of women’s clothing. They aren’t too common in men clothing, though. The head of the sleeve isn’t curved in designs like this one. It’s a straight line, connected directly to the part of the arm where it connects to the body of the wearer. This design is also commonly used in sleeveless shirts. There isn’t much to talk about straight sleeves: as their names suggests, the design is made to fit most types of arms and shoulders and keep a straight shape while doing it. Straight sleeves are also a type of set-in sleeve. This final sleeve type is often seen as an opposite to raglan sleeves. The sleeves are joined by a seam, which is curved underneath the arm. This design isn’t too efficient, but it offers fine decorative characteristics. It’s very commonly found in women’s clothing to distinguish them from men’s shirts and other types of otherwise unisex wear. Now that we’ve told you everything you need to know about sleeves and sleeve length, it’s time to show you how easy it is to measure sleeve length by yourself. Keep in mind that if you have someone to assist you with the measurements, you’ll get it done much quicker. You can also do it on your own, so don’t worry about it too much. If you want to measure your own sleeve length, you will almost definitely need a partner to assist you. 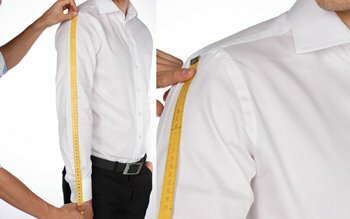 It’s not the same thing to measure a shirt’s sleeve length than to measure your own – keep that in mind before you go on. 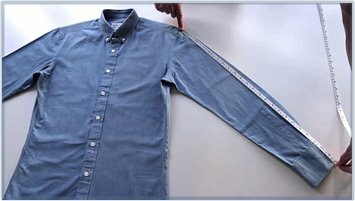 Measuring the sleeve length of a shirt is a very simple process, because you don’t need to do it while wearing the shirt itself. In fact, this is the only method where you don’t need the assistance of a third party to measure everything properly. The first thing you’ll want to do is iron the shirt. You’ll need it to be as smooth as possible if you want to get the measures right. Place the shirt on a flat surface (a bed would work well, too). Extend the sleeves but put them on a natural position. Do not fold them, nor forcefully put them in a position that would go against the way it’s seamed. You can then go on and use a measure tape from the beginning of the sleeve to the top. This should give you the first estimate of its sleeve length. Then, you should turn it around and measure it from the top of the sleeve to the neck. You could also try measuring its shoulder-to-shoulder length while you’re at it. You’ll have two values: the first one represents the length between the shirt’s neck and the shoulder seam. The second one represents the length between the shoulder seam and the wrist of the shirt. Add those two values together to get an accurate estimate of the overall size of the shirt. 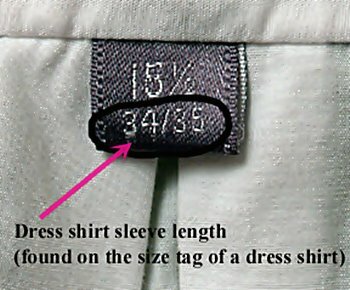 Most modern shirts come with a tag indicating all the necessary measures that you need to know before making your purchase. This is especially true for men’s shirts; these types of clothing usually include a couple of numbers on the neck tag: the first number lets the buyer know the shirt’s neck measurement. The second number represents the sleeve length of said shirt. If you’ve already measured your own sleeve length before, use those numbers and compare them to make sure you’re buying a product that fits. Otherwise, ask an employee of the store to see if they could measure your size for you, or go home and measure it yourself. If you have a shirt that first you perfectly, simply use those measures as a guideline whenever you want to buy a new shirt. Also, if the shirt you’re looking to buy doesn’t have numbered guidelines, we’ll give you one additional tip: use letter sizes as references. Small and Medium shirts often have the same sleeve length, but their neck sizes are different. The same thing goes for Large and Extra-Large shirts! The only size which has a unique sleeve size as well as a particular neck size is the XXL. This method requires the assistance of another person, otherwise the measures will not end up being precise. Doing this correctly will allow you to determine anyone’s sleeve length. To begin with, put on any type set-in sleeve shirt – it doesn’t matter if it has a neck or not, or even if doesn’t have long sleeves. What we’ll be measuring here is YOUR sleeve length measures. You’ll need to stand still and in a firm position. You can’t be moving around, and your back must NOT be curved, or the measures will not be correct. Your arms must be placed at each side of your body. They must not be entirely stretched; ideally, bent your elbows just enough to make your thumbs fit inside each of your side pockets. You’ll need to put your thumbs inside the pockets to create a small curvature on your shoulders, which reflects better how shirts fit once you have them on. Then, ask your aid to place the measuring tape just in the middle of your upper back. This means rightly below your neck. The person will have to measure the length going from the bottom of your neck to he seams that connect the sleeves to your shirt. Remember that it’s very important that you wear a set-in sleeve shirt for this process: the seam will serve as a measuring guideline. We recommend writing everything down as you go on. You’ll need to use some of these measures as reference points to get right your sleeve size. Once you’re done, ask whoever is assisting you to move to the side. They’ll need to measure the length of your entire arm. To do this, begin by placing the measuring tape on the seam located near your shoulder. Move all the way down to the wrist. Ideally, allow the measuring tape to reach your wrist bone and don’t let it fall short. Write down that value. Then, simply add those two values to get the accurate measures of your sleeve length. The overall value shouldn’t be higher than 95 cm, but it also shouldn’t be lower than 80 cm. Numbers may vary, but the result should be inside that range. The only exception to this rule comes with extreme circumstances, such as obesity or malnourishment. Also, check out our guides for handheld sewing machines and the best sewing machines out there!